Saleae makes a number of USB-connected logic analyzers. Their latest offering has a 500 MHz sample rate, and reads analog channels as well as digital. Here's my video review of it. "In science, there is only physics; all the rest is stamp collecting." - Physicist Ernest Rutherford, ca. 1900. Digikey, Mouser, Jameco, Amazon, Sparkfun, and Ebay are my favorite resources for hand tools, not in any particular order. However, I found that I really need to know the brand and part number of any tool that I prefer. For example, I wanted to purchase some diagonal cutters to put in a second tool kit, and ordered some Hakko cutters ($6.95 at Sparkfun). Although the cutters work, they are not as precise or functional for circuit rework as my Facom 417.PC diagonal cutters ($122 on Ebay) or the Xcelite MS545V ($18.40 via Amazon Prime). Some would say you get what you pay for, but you really need to know what brand and model of tool should be paid for. I wanted to let you know about a tool I recently came across while looking for a good editor to help search through some large logfiles I needed to look through to debug an issue recently. There's a text-based logfile editor called LogFilter from Casstor Software Solutions that's focused on helping filter out unwanted data to allow you to focus on only the data you're interested in. I've been developing real-time software for over 10 years and frequently run across problems where I need to review large amounts of logfile data in order to identify the source of a problem. LogFilter is the first tool I've found that is dedicated to simplifying this task. I can easily open a logfile, load some pre-defined filters and very quickly filter out all the unwanted data and be working with only the data I'm interested in. LogFilter has become my go to editor for reviewing logfiles and I think this tool may be extremely useful to your readers as well. In your Embedded Muse newsletter, Richard Tomkins mentions using STM32CubeMX. I'd like to extend a word of caution. In Fall 2014 when I last used it, CubeMX had the tendency to generate "bad code". While the code would compile, it did not properly initialize the peripherals we were using. While STM may have resolved CubeMX's code generation issues since then, I am reluctant to try it again as it wasted quite a bit of time for me and my client. At that time, STM themselves did not generate their examples using CubeMX. There were limitations in the style and order in which code can be generated, especially when using FreeRTOS. While I really like the idea and concept of CubeMX for aiding peripheral selection and configuration, it just wasn't "there" yet from my perspective. Support engineers from STM definitely tried to help us, but their hands were tied until the issues were resolved by the developers. 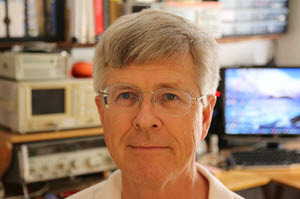 We ran a contest last month for a giveaway of a GW Instek GDS-1052-U bench scope. Over 1900 distinct people entered. The lucky winner has been notified, but as of this writing hasn't responded. I hope to hear from him soon. This week's video is a review of Saleae's nifty Logic Pro 8 logic analyzer. This month I'll give that unit to another Embedded Muse subscriber. The giveaway will close at the end of June, 2015. Go here to enter. It's just a matter of filling out your email address. As always, that will be used only for the giveaway, and for nothing else. For the past few years the PC and server world has been infatuated with multicore processors. The idea is brilliant: put several, or even many, identical CPU cores on a single chip. A smart OS can partition the workload among the processors, greatly increasing system performance. Transistors are practically free so the incremental cost is low. I use PowerDirector to create videos, and it does a great job using all available system resources. The PC Meter app that shows how much load is on each core goes to 100% on all six in my desktop when rendering video. The fan picks up speed and makes noises I've never heard before. Multicore is making its way into the embedded world, too. Sometimes naively. 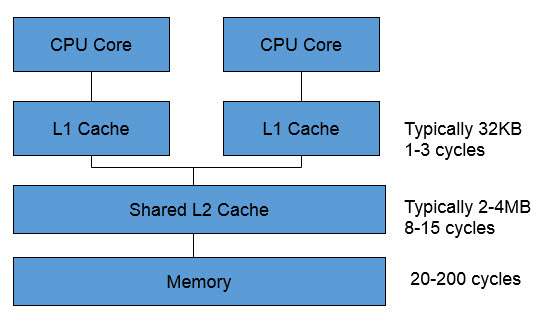 Note that the L1 cache is tiny. Even most 8 bit CPUs can address more memory. As soon as there's a cache miss a call goes to L2 or even main memory. That instruction stalls; if the other core then needs to go outside its L1, there's a conflict. Consider the stalls when going to main memory, which may need dozens (or more) cycles. Note that there are "embarrassingly parallel" problems that really do benefit from the use of multicore. Those are not often found in the embedded space. Alternatives exist. 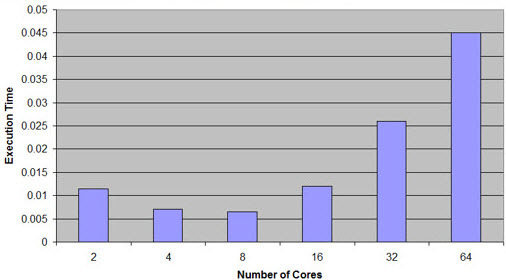 With asymmetric multiprocessing each core (and these may not be identical CPUs) has its own memory. Atmel's ATSAM4CP parts have a pair of Cortex-M4 processors (one with floating point) that do share memory. However, each core has a bit of memory from which it can run without conflicts, at zero wait states. 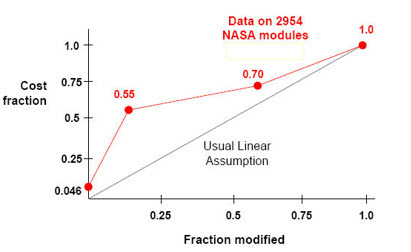 As always, read the datasheets with care and apply careful engineering judgment. And beware of hype! This article is worth reading, and offers some useful advice. How do you predict stack size? Do you do anything to monitor it during execution? Hungary is a small country, and most of our primary roads are running from the capital Budapest, which is located quite in the centre. These roads are numbered from 1 to 8. (actually the 8 is an exception, it forks from the 7) Later the highways running in the same direction, offloading the main routes became M1, M3, M7, later M5, M2 and M6. 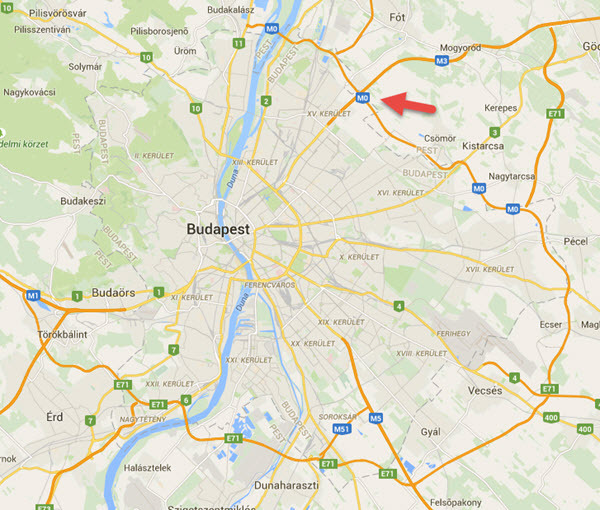 As motorisation expanded, Budapest required a ring to offload the highly concentrated traffic - like everywhere else. The 0 looks like a ring :) so, it will be M0, M-nullás in Hungarian, M-zero in english. Of course, it is not finished yet, about two third is yet to be done. The remaining floats somewhere between the dreaming and planning phase, because the missing part should run thru forests, wildlife reservation areas and beautiful hills. It might require long tunnels too, and it is quite expensive.